WELCOME TO MY MONEY MISSION ONLINE: WONDERFUL WEDNESDAY MOM MINUTES AND MORE! WONDERFUL WEDNESDAY MOM MINUTES AND MORE! Today is looking much better, bloggy friends; the sun is shining, the birdies are singing, and Mom has some great tips for all of you!! I went to her apartment the other day, for DQ ice cream (my treat! ), and she had a BUNCH of tips, all wrote down nice and neat, on lined yellow paper. So, I am starting with the first one, and without further delay, here it is everyone: Mom Minutes! Since frugal is finally "in" and everyone is searching for ways to get more "bang out of their buck," I have put together some money saving tips that I have collected over the years. These tips have saved me (LITERALLY) tons of $$, and I am happy to pass them onto all of you. My Tip #1, for this week, involves hand soap. Yep, good old hand soap. The kind that you buy in the store that looks so pretty in that beautiful container that matches-your-counter-perfectly and you just love it. Well, when that hand soap runs out, you decide to go and buy the refill. Then you look at the price of the refill and you go, "Ouch!" Yep, refills can be pricey. But, did you know that you don't need to buy the expensive stuff to get good quality, nice smelling hand soap. 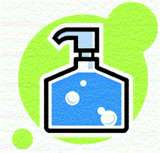 You can purchase inexpensive liquid dish soap and use that as a refill. There are many colors and fragrances to choose from, and there is certainly one that would suit your need. For those of you who have the pump containers (that give out foamy soap), I use the inexpensive, generic dish soap. It tends to be thinner, and I add about 1-2 T per bottle, fill the rest up with water,gently shake it back and forth until mixed, and I have my own foamy soap! There you go! If you're like me, you have saved some of those now-empty containers because the cost of re-filling them just didn't seem worth it. Well, now you can get them back out and start re-using them, because you have a cost-effective way to do it. Better yet, get out those coupons you have for dish soap, check some ads, and see if you snag some soap for little or nothing! I was over at Nicoles Nickels and she has a great post about what she has received in her Inbox this week. One of her readers informed her about a great promotion at Quiznos this week where you buy any size Turkey Ranch & Swiss, Classic Italian, Mesquite Chicken or Traditional at regular price and get a second, same sub same size, for ONE DOLLAR! Buy One Get One for One Dollar, that's a good deal - check out the store locator and if there is a "$1 toasty toasty" icon next to it, then it's participating. Call ahead to be sure! Yay. Mom must've had that intuition again that I go out and buy Softsoap. Have a better day! I hope you are feeling better knowing that those kids have serious issues to be acting that way around animals not to mention a combative mother so you helped them if only for a few hours by being kind no matter how difficult that time was. Tell mom thank you! And I'm glad that you are doing better, I was worried about you. Hello Helene...haha, that is funny about the Softsoap...see, my Mother knows best!! She says that you are welcome to come visit her anytime! On the subject of those kids, my hubby says the same thing, that they have some Serious Issues! Hey! With BlogHer, I applied over a year ago and just got accepted a few weeks ago! You go to BlogHer.com and the application is on their site. I've seen a jump in my page visits since putting it there and along with their ads they also put links to other blogs out there and mine has been listed twice, so that's a cool thing. And YES, if you want to join the campaign to get me a Disney sponsorship, that would be great!